These pens might be mightier than the sword, but they’re no match for the internet. Digging through my desk today for a gizmo or a widget or something, I came across some pens. That’s not unusual, of course. There are hundreds of pens in this house, almost all of which are disposable. But at one time or another, someone has given me a pen with replaceable ink cartridges as a memento. 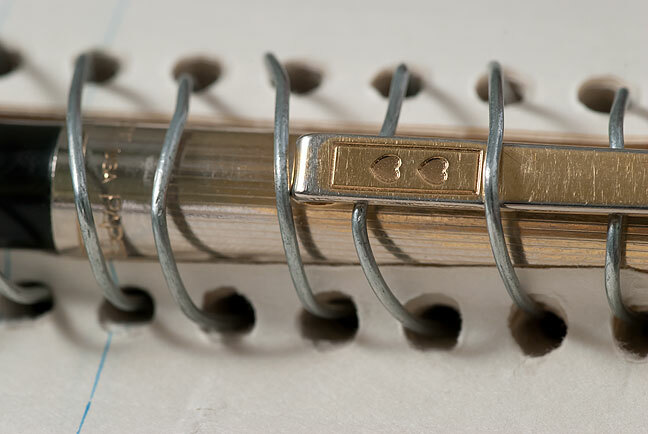 When I graduated from high school, a former girlfriend gave me a grey and gold Cross pen. When ECU Athletic Director Tim Green retired, he gave me a silver Cross pen. When we were dating, Abby gave me a Space Pen. All the gift pens still work to this day. I know because I tried them all just now. The only pen that doesn’t work is my favorite for years, the black and gold Paper Mate. It might have been a Christmas gift, or it might have been something I found in Mom and Dad’s stuff and asked if I could use. In my junior year in high school, it replaced the standard white disposable Bic pen that resided in my left front pocket, which left a pen-shaped mark since I always put it back in the same place. By then my writing was less about self-expression and more about being the best at something, so it was not only full of wise-cracks and embarrassingly Douglas Adams-esque circuity, my goal was to write as much as possible every day. The Paper Mate was smooth and light, and made nice, dark words on the page. It was something of a milestone, and a point of pride, when I wrote en entire ink cartridge dry, and that happened time and again. The pen was so light and smooth, in fact, that it remained once of my all-time favorite writing instruments all the way through to the blog era. This is the clip from my Paper Mate pen. You can see that years of carry and use wore off much of the finish. Since I no longer have ink for it, and seldom write in longhand anyway, I have decided to leave it clipped into a spiral of one of my early journals. Like you, I’ve gone through quite a few pens. Some were better than others, but almost none of them ever felt excellent in my hand. Though I wrote (and drew) constantly, I never felt quite at home with a pen in my hand. My hands hurt after a few minutes of writing. Maybe I was never holding the pen the right way. My grandfather was crazy about Paper Mate pens. (As an unrelated aside, he was also a studio portrait photographer.) He carried a Paper Mate with him wherever he went and prided himself on his penmanship. To my knowledge, he never used another brand of pen. When I joined the newspaper biz at age 19, our reporter and staff photographer carried Cross pens. I immediately wanted one; they looked professional. I got one that year for Christmas and promptly lost it. I continued using Cross pens though I don’t think I ever tried to sell my grandfather on Cross. 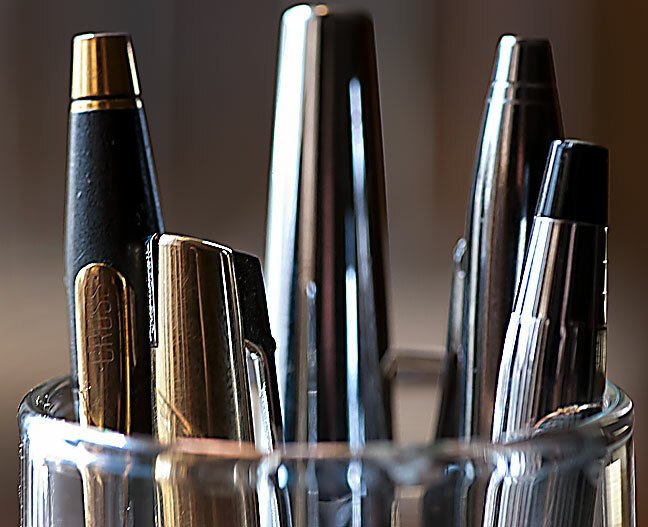 I have a reporter friend who refuses to “sully his hands” with any brand of pen other than Cross or Mont Blanc (I also used to own a couple of MBs). Today I have no unique, special or expensive pens because they are too easily lost. I have two ballpoints stolen from the Capital Hotel Bar & Grill, my favorite watering hole, which is so classy they actually give out nice ballpoints for signing your check. Otherwise, I have given up my fascination with pens.